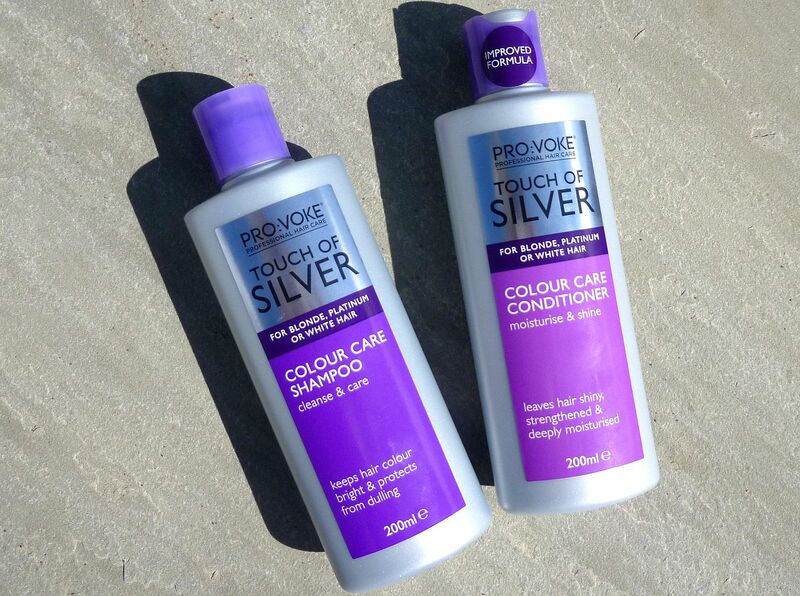 'Pro:Voke' Touch of silver shampoo & conditioner review. Today im reviewing for you all this shampoo and conditioner duo! Now, some of you may see this and think 'surely shampoo and conditioner is just shampoo and conditioner?' But i actually have heard so many things about this set that I just thought I NEEDED to give it a little go. Also, after having my hair recently dyed darker than I am used to I decided i'd help it along the way to being blonder again using some products. Obviously, the beauty of products is that they work differently for absolutely everyone and heard good things about 'purple shampoo' before but always used to massively freak out when contemplating using it just incase it actually made my hair turn purple. When i spotted this in my Mums shower it became apparent that this obviously doesnt happen as the bottle was half empty and my Mums hair was still bright blonde. Another reason for this purchase was because I couldnt believe how cheap it actually was to buy! I picked it up from superdrug and at the time I'm pretty sure it was on buy one get one half price, therefore I definitely couldnt resist. Anyway, on to the review... In order to boost the effects of these products I actually decided to use them whilst I was on holiday in Croatia last week. The bottles arent huge but they lasted me more than the full week in Croatia and i used both every day. Upon using them for the first time I couldnt believe how beautiful the smell was!! Like actually such a dreamy scent!! You dont need much product at all to be able to lather your hair completely which is obviously great and the conditioner left my hair feeling super silky and smooth. I have noticed a MASSIVE difference in the glow in my hair and the blonde tones appear to be more noticeable from a week in the sun and using this amazing duo. Usually when i come home from holiday I leave all of my shampoos etc there or throw them away but this one I just simply couldnt throw away or leave behind! I am definitely going to repurchase this, especially as its such amazing value. I think collaboratively the sun and the brightening effects that this shampoo and conditioner have, has worked amazingly together and my hair does not feel at all dry like it usually does when I come home from abroad. Also im completely loving how much its brightened up my blonde ombre! This product will be incredible coming in to autumn and winter to ensure a nice healthy glow and shine to my hair! Hello I'm from Brazil want to partner with you !